1. Plug the Ethernet Cable (from your existing router) to the KP322 AP's Ethernet Port. 2. Decide which working mode do you need? Please refer to the following description to choose a proper mode. If you want to convert your wired (Ethernet) network to a wireless network, please choose AP Mode (Default Mode). If you want your devices connected to different wireless network and isolated by VLANs, please choose Multi-SSID mode. 4-Step to setup your network via Smartphone in 4 or 5 minutes. * Beamforming technology to concentrate Wifi signal to your devices. 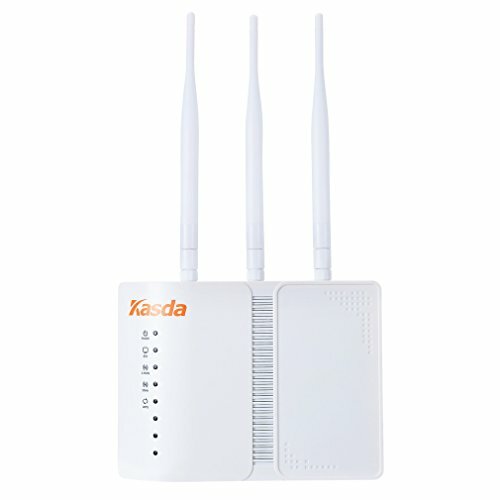 * High power Wifi to enjoy 5GHz connections with less interference and same range as 2.4GHz. * 3 x External detachable 5dBi high gain antennas for better Wifi coverage & maximumly reducing dead zones and buffering. * Excellent balance between signal strength and speed loss protection, ensuring accept able connecting experience while staying not close to the router. Supporting up to 20 languages including English, Spanish, French...etc, the router will automatically to the same language used in the OS on your computer, smartphone or tablet. With one Passive PoE Injector in the package, it support Ethernet cable length up to 99 feets for passive PoE application, wall mountable design for easier installation both at home or in office. > Effortless Setup via Smartphone: 4-Step Setup, customer can get it up and running in 4-5 minutes. No PC/Laptop/Mac needed for Setup or Management, NO need to download any App. > Wall mountable design with 3 x External detachable 5dBi high gain antennas for better WiFi coverage. > Before Starting to Set it Up, please make sure to install it properly first with an Ethernet cable plugged to the KP322 AP well. > Passive PoE Injector included, support Ethernet cable length up to 99 feets, for easier installation at home or in office.